Social Potluck was created by Gabriel Newman as his masters’ thesis project at the University of British Columbia- Okanagan. Newman called the structure Social Potluck because in it he creates community storytelling exchanges. In North America, the term “potluck” refers to a dinner created by each guest bringing a dish of food to be shared among the group. Since guests don’t know what other will bring, there is an element of “luck” regarding the resulting meal. The Social Potluck project began with the basic premise that the most important performance venue we have as a society is at the dinner table. The dinner table is where we perform ourselves. As a performer I view all communal eating activities, such as dinner parties, family gatherings (formal or informal), romantic dinners, picnics, campfire cookouts or church potlucks to name a few, as improvised community theatre where everyone is both a performer and a spectator. This is live, embodied performance that is immediately relevant. I wanted my work to feel as directly relevant to the spectator (Newman 11). The structure itself is quite simple. First, a series of small dinner parties are hosted by the performer(s) for no more than six people at a time. The dinners are prepared by the artists and held at a local location that has a kitchen (community group kitchen, church, showroom in a housing development, etc…). There is no financial cost to attend. Instead, guests pay by providing a story and sharing it at the dinner. The evening is comprised of listening to everyone’s story. Participants are both audience members and performers. They ingest the stories along with their dinner, and perform their stories, along with the other guests. The artist(s) record these stories. After the dinners are complete the artist(s) go over the stories and create a menu (performance) of the stories heard. There may be appetizer stories, palette cleansers, pasta, main course, dessert and tea or coffee stories. In the second half of the project, the stories are presented back to all the participants and their guests at a large final gathering. The audience for this performance is often seated in a circle or a thrust configuration. By making audience members visible to each other within the space, a kind of “entreveillance” occurs, a dynamic in which there is “observation from between or within the audience during the performance” (O’Donnell 61). Because the stories come from the community itself, the audience is greatly invested in them. People delight in watching an audience member watch their own story being told. Thus the performers are catalysts for a poignant community experience of shared history and belonging. The fee to attend the performance is a dish of food to share during the performance. This work is so inspiring and illuminating! Thank you for gathering us, for listening to us, and for reflecting us back through the lens and kaleidoscope of your diligence and innovation! Beautiful Work. What you offer feels like one giant gift. Thanks so much for adding so much life and art to a community’s stories. Yes, we all “know each other”- that’s what makes this format so enjoyable for us, the audience. We now have another connecting thread the next time we see them! These stories you retold here will become part of our community’s fabric. Social Potluck is an ephemeral place-based performance project. While Newman’s thesis work involved only one performer and spanned a period of months, Denise Kenney has been working with Newman to develop a shorter, ten day structure facilitated and performed by two to three performers. The shorter, more contained structure is more easily replicable and adaptable to different situations, communities and social groups. It creates a heightened sense of tension, drama, and energy as the community knows that performers have very few days to create the final performance out of the shared stories. Two or three performers also increase the interactive possibilities between characters and between performers and audience. Depending on the respective skills of the facilitator/performers, dance, music and digital media can be integrated into the final performance or “re-telling” of the community stories. 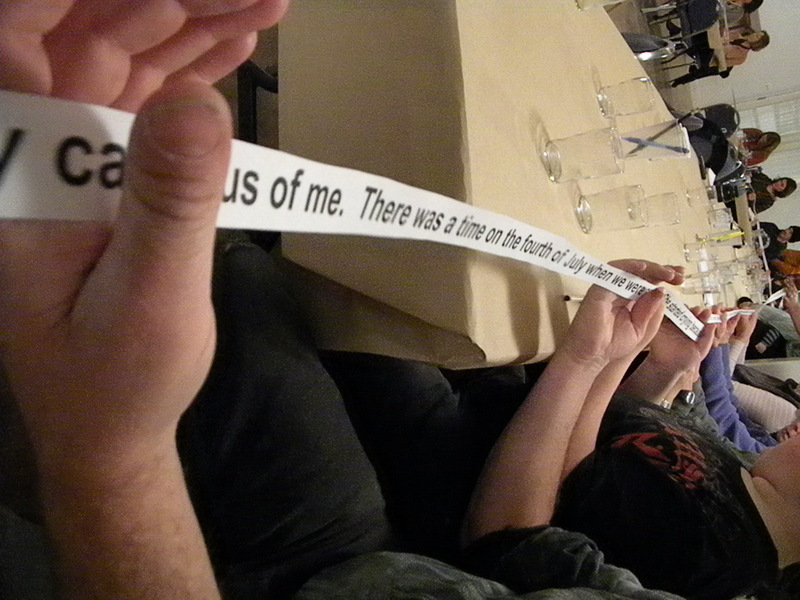 One method for sharing stories has been to have the audience collectively pass a ribbon of text and read it in silence. Those who receive the story ribbon first respond to what they are reading and become, in a way, performers for those anticipating what they are about to receive. Another method has been to literally cook a “soup of stories” in the centre of the space, attaching story details to each individual ingredient added to the pot. While Newman’s structure did not prescribe place-based storytelling, the Eco Art Incubator developed this parameter for the project, necessitating a focus and interest in local knowledge. This resulted in an increase in stories related to the immediate environment. In 2012 Newman and myself produced the project in Port Townsend, Washington. Port Townsend is a small old Victorian boat-building and tourism community just outside of Seattle on the Olympic Peninsula. The town also includes a paper mill and has a view of a naval base just off shore. The stories from Port Townsend ranged from gay marriage rights, ocean life, Victorian history, military intimidation and seasonal harvests, to relationships with raccoons and dealing with death. Interestingly, all the stories grappled with the notion of belonging. The project is being commissioned by CATCH (Community Action Toward Children’s Health) for the fall of 2013. In this case Social Potluck will narrow its focus even further and hold dinners in smaller neighborhoods to tell stories from or about those neighborhoods. The project was funded by The Western State Arts Federation and The National Endowment for the Arts, Mandala Center for Change (MCC), Inner Fish Performance Co., the Faculty of Creative and Critical Studies and the Eco-Art Incubator (SSHRC). Newman, Gabriel. “Social Potluck: Everyone has something to bring to the table.” MFA Thesis. University of British Columbia – Okanagan, 2012. Print. O’Donnel, Darren. Social Acupuncture: A Guide to Suicide, Performance and Utopia. Toronto: Coach House Books, 2006. Hi I love your project! Please let me know how I ca Know more about it. I’m in Kelowna and running a Non-Profit Society which try to connect people through social meeting groups and support creativity and innovation for entrepreneurs and artists promoting international cultural experiences around of the Okanagan Valley.